Thanks to PHS Online for some of these statistics. Introduction: Having watched first the Ford Mustang and then the Chevrolet Camaro enter into the pony car market, Pontiac finally got into the act in the middle of 1967. The Firebird was offered with both six and eight cylinder engines, like the Mustang and Camaro, and was based heavily on the Chevrolet Camaro chassis. Pontiac did try to make it their own and would create a European styled and mannered pony car that could hold its own against its more experienced competition. Comments: The Pontiac Firebird was released five months after the Chevrolet Camaro, and offered buyers choices of six and eight cylinder engines. Pontiac was able to use that additional time to create a unique identity for the Firebird, despite having to use the Camaro chassis and some body panels. 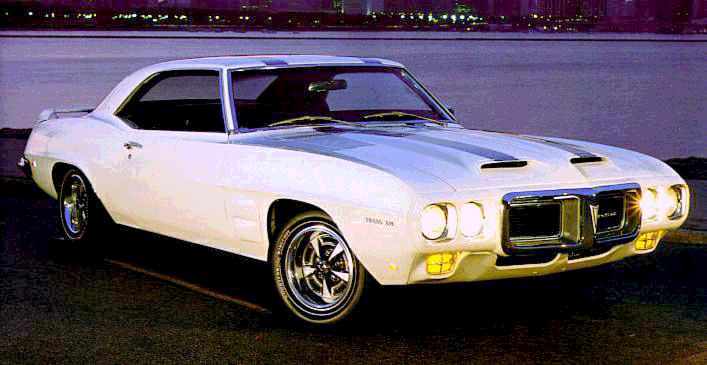 Despite using the same front fenders, doors, and rear fenders as the Camaro, the Firebird's styled split front grille, beaked hood, and GTO-slitted taillights gave it a distinctly Pontiac apperance. But the key differentiator was under the hood, where the Firebird offered a range of Pontiac engines. Initially, five different Firebirds were available, named after their respective engine choices. At the bottom was the lowly 230 cubic inch OHC six cylinder engine with a single 1bbl carb, rated at a measily 165 bhp. Stepping up to the "Sprint" version got the buyer a 230 I6 with a 4bbl carb rated at 215bhp. Either six cylinder was linked to either a three or four speed manual or two-speed automatic transmission. Although the six cylinder engines were more powerful than Chevy's offerings, most buyers wisely opted for one of the available V8 engines. At the bottom was Pontiac's 326 V8 with a two barrel carb that was rated at 250 bhp. A special "H.O." (High Output) version of the 326 V8 fitted with a four barrel carb was rated at 285bhp. At the top was the 400 V8 borrowed from the GTO. This engine was rated at 325 bhp, and was available with or without Ram Air (which suspiciously didn't affect the engine rating, hmm.) The Ram Air engine included a hotter cam, stronger valve springs, and made use of the otherwise decrorative hood scoops. With no publicized power increase and a hefty $600 price tag, the Ram Air option was rarely ordered. All V8s came with a standard heavy-duty three speed manual transmission; a four speed manual and three speed automatic were optional. Performance axle ratios up to 4.33:1 were available as well as front disk brakes. Firebird prices were roughly $200 more than comparable Camaros and the Camaro outsold it two to one. But Pontiac's pony car had arrived. 230 I6 (1bbl) 165 bhp. 230 I6 (4bbl) 215 bhp. 326 V8 (2bbl) 250 bhp. 326 V8 HO (4bbl) 285 bhp. 400 V8 325 bhp @ 4800 rpm, 410 lb-ft @ 3400 rpm. 400 V8 (Ram Air) 325 bhp @ 5200 rpm, 410 lb-ft @ 3400 rpm. 400/325: 0-60 in 6.2 sec, 1/4 mile in 14.7 sec @ 98 mph. Comments: The Pontiac Firebird underwent minor changes for its second year. On the exterior, it lost its side vent windows and gained fender marker lights. The interior was revised and the rear suspension was refined with the adoption of staggered shocks in the rear (one in front of the rear axle and one behind) and the use of new multi-leaf rear springs. The big news was under the hood. The standard 400 engine gained 5 bhp to 330 while the Ram Air engine was rated at 335 bhp. In mid year, it was replaced by the 340 bhp Ram Air II. Newly available was a third 400 V8, named the HO (High Output) that was slotted between the two other engines. The 400 HO cam with free-flow exhausts and its own revised cam (when mated to the four speed manual). It too was rated at 335 bhp. On the lower side of the model line, the 230 I6 was replaced by a new 250 I6 and the 326 V8s were replaced by new 350 V8s. Performance was definitely the key at Pontiac. 250 I6 (1bbl) 175 bhp @ 4800 rpm, 240 lb-ft @ 2400 rpm. 250 I6 (4bbl) 215 bhp @ 5200 rpm, 255 lb-ft @ 3800 rpm. 350 V8 (2bbl) 265 bhp @ 4600 rpm, 355 lb-ft @ 2800 rpm. 350 V8 HO (4bbl) 320 bhp @ 5100 rpm, 380 lb-ft @ 3200 rpm. 400 V8 (4bbl) 330 bhp @ 4800 rpm, 430 lb-ft @ 3300 rpm. 400 V8 HO (4bbl) 335 bhp @ 5000 rpm, 430 lb-ft @ 3400 rpm. 400 V8 (Ram Air) 335 bhp @ 5300 rpm, 430 lb-ft @ 3600 rpm. 400/335 (HO): 0-60 in 5.5 sec, 1/4 mile in 14.2 sec @ 100 mph. Comments: The Pontiac Firebird underwent a major restyling for the 1969 model year. The front end was redone and the rear end and interior were changed slightly. The redesign did not do well with customers, and sales fell, despite the fact that production lasted for 17 months, well into 1970 due to production problems with the 1970 model. The Ram Air 400 was renamed the Ram Air IV and had a slight increase in power. The 400 HO option was known as either the Ram Air, Ram Air III, or simply HO. It too received a slight increase in power. In March of 1969, Pontiac released a little publicized option package, the Trans Am Performance and Appearance Package. Conceived to campaign in the SCCA's road racing series (with a special 303 cubic inch V8 which was never offered in production cars), Pontiac paid a $5 license fee to SCCA for each Trans Am sold to use the name. Offered as a $725 option, only 689 Firebird coupes and 8 convertibles (talk about a collectible) were built. Although not apparent at the time, the Pontiac Firebird Trans Am, along with the Chevrolet Corvette, would be the only American high performance cars that would remain in continuous production since their inception. The Trans Am came standard with the HO engine with Ram Air (also called the Ram Air III). The only other engine option was the 400 Ram Air IV, ordered on just 55 coupes. All Trans Ams were Polar White with blue racing stripes, tail panel, and decals. The exclusive hood had functional air intakes which could be closed by the driver and functional fender scoops designed to vent the engine bay. A 60 inch rear foil (spoiler) was mounted on the trunk. Although the Trans Am was no faster than similarly equiped Firebirds, it represented the peak of Pontiac performance excitement. 400 V8 330 bhp @ 4800rpm, 430 lb-ft @ 3300 rpm. 400 V8 (Ram Air II) 335 bhp @ 5000 rpm, 430 lb-ft @ 3400 rpm. 400 V8 (Ram Air IV) 345 bhp @ 5400 rpm, 430 lb-ft @ 3700 rpm. 400/335 (RA IV): 0-60 in 6.3 sec, 1/4 mile in 14.1 sec @ 101 mph. 1980-81 Turbo Trans Am Registry!